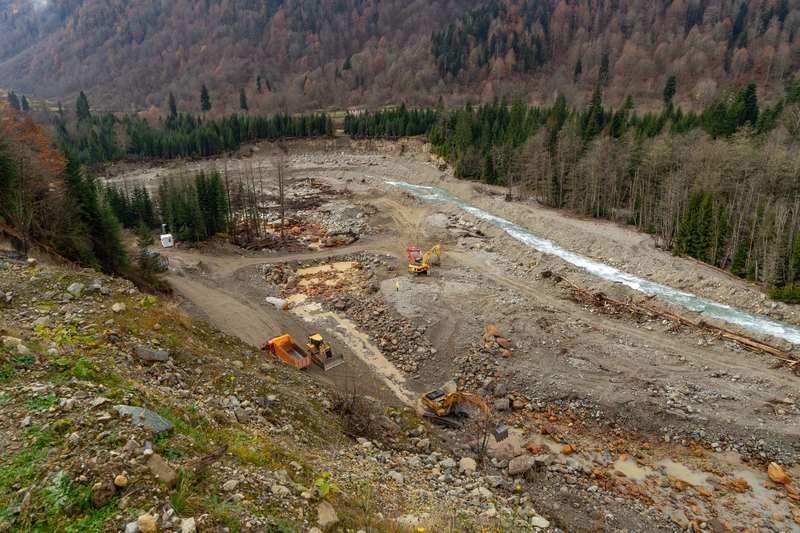 JSC Nenskra Hydro, Nenskra Hydropower Plant (HPP) project company resumed the preparatory works in village Chuberi of Mestia municipality. The July 5 flood-affected road stretch is being reconstructed now. The reconstructed road stretch will contribute to free movement of the local community members, and the construction company will get access to the next affected stretch to reconstruct. The following works are to be executed to reconstruct the road stretch in question: a temporary canal will be trenched to divert the river flow, river bank protection works, set up a rockfill and divert the river flow back to its original course. About 10 pieces of heavy vehicles and equipment are mobilized on the site. The works are being executed by Georgian Construction Consortium, contractor of Nenskra Hydro. The next phase of the pre-construction work will include construction of 3 bridges on the Nenskra river. Overall preparatory works that will include the rehabilitation and construction of the roads and bridges in both Nenskra and Nakra valleys, as well as power supply line installment, shall be concluded by December 2019.